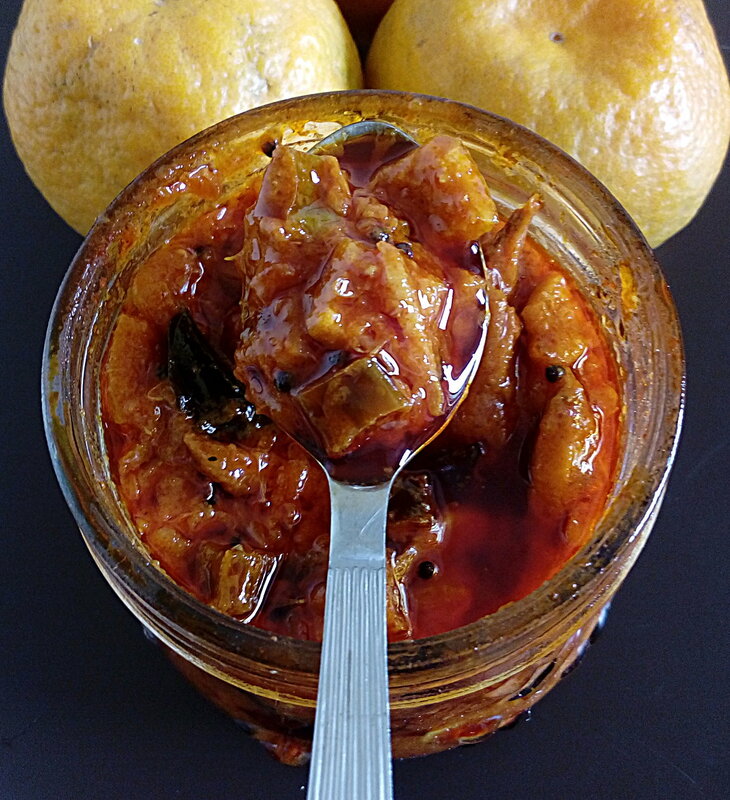 Lemon pickle is a very standard fare in all Indian homes. No Biriyani meal is complete without it. However it doesn’t quite satisfy the craving for a sweet tangy flavor that sometimes suits a snack or a toast spread. The recipe I have for you is a Orange pickle that tastes as good as it looks. It is a great way to use up all the extra fruits lying around. The best part you can store it and have it anytime you felt like it. Enjoy :). 2 to 4 Green Chillies cut in thin rounds. ½ teaspoon Jaggery or Sugar. 1. Preparing the skin of the orange: Clean orange. Remove the skin of orange. Remove the pith (fibrous white threads) from the skin of the orange. Dice the skin into squares. Boil the skin with turmeric and salt. Cook for two minutes. Strain and keep aside. 2. Preparing the segment of the orange (pods): Remove the skin from the orange pods (segment). Cut each pod (segment) into two. 3. Heat oil, add mustard seeds and wait for it to splutter. Add curry leaves, green chilly, ginger and garlic; saute for a while. Add the skin of orange; saute till slightly crisp. To this add the chilli powder, asafoetida (hing) and the methi powder. 4. When the raw smell of the powder has gone; add the orange pods (segments). Mix well. 5. Add vinegar, add jaggery or sugar. 6. Cool and store in an airtight jar. 2 Responses to "Orange Pickle"
I tried it..it was awsome..thank u for the recipe..
You are welcome. Thank you for trying out my recipes and providing feedback. Enjoy.